. Pally Palette: Year 1s meet Monet. As I mentioned in my first post,I recently travelled to Europe. 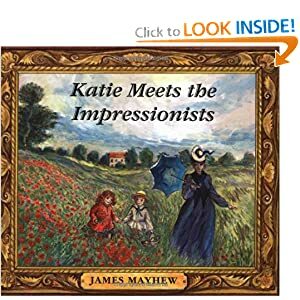 While I was there I visited Monet's garden and bought this book called Katie Meets the Impressionists. These art works were created over two sessions. Following the story in session one the kids created light and dark green using their fingers to mix cool blue and cool yellow with a mid green to make a selection of light and dark greens for their background. We created poppies by cutting or tearing warm red and orange paper, pressing them into our palms to create a 3D effect. We talked about how we could make some poppies look closer than others by making them bigger and putting them towards the bottom of the page.